The North Country Trail Association in Ontonagon and Gogebic counties (#2 on the map) will receive $4,200 for four separate informational panels at trailheads. North Country Trail Association in Luce County (#3) will receive $17,050 for improvements of five trail sections around Wolf Lake. Ottawa Forest in Ontonagon County (#4) will receive $30,000 to help replace the Bush Creek Bridge. GEI Consultants in Iron County (#16) will receive $30,000 for a feasibility study to connect the east and west segments of the Iron Belle Trail and the Iron County Heritage Trail. Paul Yauk, state trails coordinator with the DNR, said that roughly 72 percent of the hiking route and 60 percent of the biking route now are complete. “There were many worthy projects seeking funding this year. After much consideration and evaluation of these proposals, the chosen award recipients are the ones the department believes will best help develop Michigan’s Iron Belle Trail and strengthen our reputation as the nation’s Trails State,” Yauk said. This year’s funds were part of the Michigan Department of Natural Resources’ 2017 budget for the non-motorized trail program. This is the third year of grants issued specifically for Iron Belle Trail development. The DNR awarded $250,000 in 2015 and $350,000 in 2016 for various projects, many of which have been completed or are nearing completion. 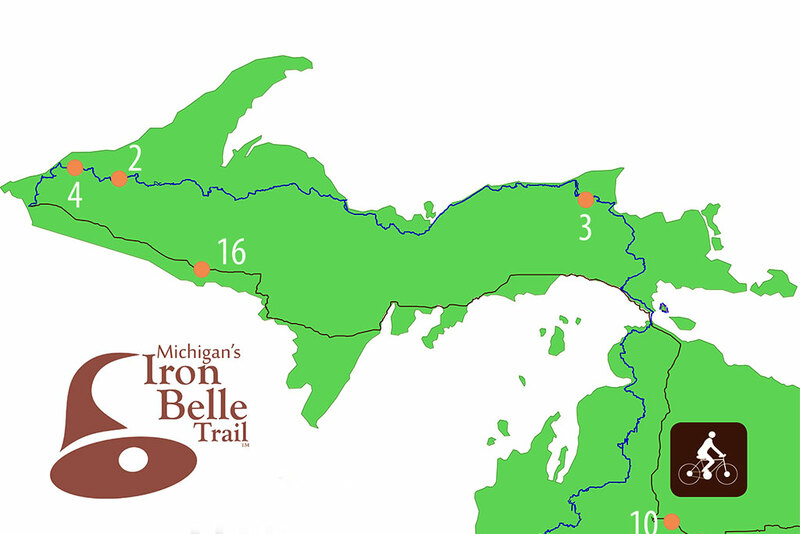 Michigan’s Iron Belle Trail extends from Belle Isle in Detroit to Ironwood in the western Upper Peninsula. Share the post "Four U.P. projects along Michigan’s Iron Belle Trail receive development funds"
Categories: Featured, Gogebic County, Iron County, Luce County, Ontonagon County, and Outdoor Activities.